Picture if you will, a four-deck, 100-gun, 2,500-ton vessel crossing the Pacific loaded with treasure and not making landfall for six months. Picture it as short and broad—with high fore and stern castles—carrying so much silver and gold, it draws 40 feet of water while skirting coral reefs 30 feet deep. It’s no wonder that close to 100 of them sank from 1570 to 1815, leaving a trail of treasure across the globe, while enhancing the image of adventure on the high seas aboard the MANILA GALLEONS. Nowhere in the annals of the Spanish Empire’s colonial history did a treasure fleet attract so much intrigue and notoriety for its precious cargoes bound for the Far East. Maritime historians continue to pay homage to these vessels and their influence on international commerce that lasted for over 200 years. These were the largest ships afloat, plying long and risky routes. Convoys of two to five ships left Acapulco, Mexico, setting sail for the Spanish colony of Manila in the Philippines. On an average, three to five million silver pesos were shipped annually from Mexican mints to Manila, the “Queen of the Orient.” The sliver and gold was waggishly referred to as “silk money.” Silk stockings were prized by the fashionable Spanish gentry in Mexico and Spain. But the silver and gold bought other lavish exports as well. They came from all over the Far East: spices, Ming porcelain, opals, amethysts, pearls and jade. There were art treasures, ebony furniture, carved ivory and other exquisite rarities found only in China, Japan, India, Burma and Siam. The galleons, after a long and laborious return voyage eastward, often made landfall around Cape Mendocino, California, then sailed on to Acapulco. Once unloaded, the cargoes were transported overland by mule train to Veracruz and then taken by Spanish galleons to Seville, Spain. 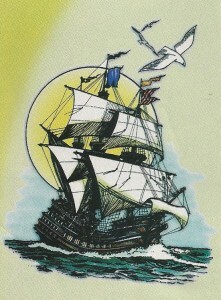 Five Manila Galleons are known to have sunk off the west coast of the United States. 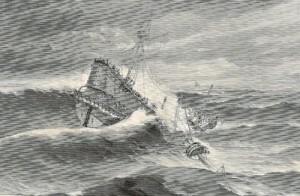 One, the San Agustin, sank in 1595, victim of a gale in Drakes Bay, northwest of San Francisco. Manifests show that one third of all the silver and gold mined in the Spanish New World made its way to the Far East aboard the lumbering Manila Galleons. Ingots and heavy chests of coins were stored over the keel in the main hold, often the only ballast used for draft and stability. The ships also carried supplies to colonists in the Marianas and Philippines. The Strait of San Bernardino, on the eastern end of Luzon in the Philippine Archipelago, separates the Pacific from the China Sea and remains one of the most treacherous passages ships must ply. Even the most seasoned mariners fear entering and exiting the shallow poorly marked waterway. Of the approximately 130 Manila Galleons lost, close to 100 sank within a 50-mile radius of the entrance to this dangerous strait. Some of the vessels simply ran aground on reefs or shoals, while others were lost in storms or sunk by British and Dutch privateers. Manila Galleons are out there. Picture them if you will, resting in the Pacific Ocean and China Sea–emblazoned with the regalia of Royal Spain and the Roman Catholic Church–waiting to be discovered by modern-day adventurers. Thanks for a very interesting article. I had no idea the Manila Galleons ever existed. I thought that most of the sunken treasure galleons were sunk off Florida and the east coast of the U.S.
Have you ever had the opportunity to dive on a Manila galleon? They sound exciting with all those those treasures from the Orient aboard! For what I understand the ones with more precious metals such as gold and silver were the ones going from Acapulco to Manilla (please correct me if I am wrong) In your opinion which one would be the manilla Galleon shipwreck with the most valuable cargo? In response to the question from Luis; The gold and silver coins and bullion were primarily originating from mines in the western and central provinces of New Spain. The port of Acapulco was used from the beginning of the Manila Galleon trade missions. As the mines in the western provinces were developed and the oldest mines in the central province of Guanajuato diminished; the port of San Blas was built north of Acapulco to facilitate access to the mines in the Guadalajara province which encompassed the present day states of Nayarit and Sinaloa. The port of Cabo San Lucas was the first stop before continuing up the Alta California coast to Monterrey and then west to the Phillipines. I find it difficult to believe that any “Manila Galleon” would tack over 1,000 miles up the California coast before heading out to the trade winds to cross to Manila. It is more likely they would reach out several hundred miles to the trade winds and then reach up toward Manila. The Galleons were never known to be able to sail close hauled and the thought of these slow and unmanuerable ships fighting the headwinds and current to “beat” up the coast over a thousand miles seems highly unlikely. Bud, I would love to see your photo, as I know Cascade Head well. I worked along Siuslaw National Forests for many years and I have a B.S. Degree from Oregon State University in “Technical Journalism”; and my 2010 nonfiction book PACIFIC COAST PIRATES AND SPANISH GALLEONS in available on Amazon. i found a possible 1600 century spanish galleon. if interested pls call +639178168165. tnx. I HAVE A HOME IN ” SOGOD, CEBU- PH. ” ! ELLSWORTH BOYD, I AM A CERTIFIED DIVER & WOULD LIKE TO SPEAK WITH YOU? I DIVE IN THE “CAMOTES SEA”, AROUND THE ISLAND OF CEBU. THERE IS A (FORT SAN PEDRO) THE OTHER IS (FORT SANTIAGO) IN LUZON, MANILA,PH. THERE ARE TWO CHURCH’S ONE IN CEBU CITY. THE OTHER ON “BANTAYAN ISLAND, CEBU”. BOTH BUILT BY THE SPANISH, IN THE 1500’s! PLEASE EMAIL ME !!! THANKS, MARK ……. Anyone have any information about the Manilla Galleons in Baja California. IE How often did they go into Cabo San Lucas? What was theie purpose of going into Cabo San Lucas bearing in mind that in those days it would have been a pretty inhospitable place. Are there any records of these galleons being wrecked along the Baja Coast? My interest is purely historical. Such a nice to look back the heritage and how trading begun by these very unique and remarkable treasures that could make a big change in the economy to this present time. Yet those lost pieces of treasure drawn in the ocean or seas be the dream of everybody for them find it and be their key for retrieving our lost in the economy. But where we can find them? For me seas ,is familiar to me where I experience and try to explore in it. but because of less training and expertise in diving I can’t perfectly explore to what I what knew about it. Our Place was the safe passage of the shipping lines or it was the gate way of voyaged from South to North of the country. Folklore says the golden ship passes along the cost from the tips of island to another islands with the triangular route flashes its prickling and shiny gold ship and only seen every silent dark night from south to north moving back and forth. Evidence of it was the ancient belongings of the the centuries that still under the care of the local people acquired from their forefathers out of the trade during 15th to 18th centuries. Maybe the lost galleon those time were still in the bed of our undisturbed sea bed. Evidence shown its present were the discovered porcelain caught of the hook by the fishermen and the pieces of it in the shoreline during bad weather in the Southwest monsoon range. The ship wooden plucking were scattered in the sea bed. That means those undocumented discovered be accounted for. In this place many were asking where to find them.? Questions remain questions but until when? I am some what curious about the cargo of a Spanish Galleon. If silver was shipped from Acapulco to Manila why would they ship it back? As silver was shipped from Acapulco to Manila why would it be sent back to Acapulco? I dont belive there were so many as 100 wrecks. Can you tell me were you have found that number? Thanks very much. Does anyone know anything about the last of the ‘Manila Galleons’ (or “Nao de China”)? The trade was ended in the period when Mexico (& much of Central & South America gained independence from Spain, very roughly ca. 1810-1820. I’ve read that the final “galleon” was a frigate, the ‘Magallanes’ (or ‘San Fernando’, alias ‘Magallanes’), which left Manila in 1811 and “sailed into Acapulco to find that Mexico had rebelled against the Spanish crown” (possibly in early 1811, when Mexican insurgents held, or at least beseiged, Acapulco briefly). This ship eventually returned to Manila from San Blas, up the coast, in 1815 (“with its hold virtually empty”). This (‘San Fernando’, alias ‘El Magallanes’) may have been the main “galleon” from 1794-1815. There were also a ‘Fidelidad’, ‘San Rafael’ and ‘Victoria’ (and maybe ‘Rey Fernando’) which may have sailed from (or at least into) Acapulco in 1814(-15). The Mexican insurgents had been attacking Acapulco since 1810, took it in 1813, burned it and then lost it again in 1814 to the royalists, who held it until final Mexican independence in 1821. The “annual reception” of the Manila galleons was reportedly shifted to San Blas in about 1815, however, which implies that there might have been more ships – possibly up till 1821. The “Nao” appears to have been formally abolished in April 1815, however, and I haven’t seen any names or details of any later ships. Maybe ships arrived from Manila after 1815, but none sailed (or carried cargo) back, or maybe it was just the last of the ships, in 1814-15, which used San Blas only but not Acapulco. I have seen a reference to the fitting-out of ‘Magallanes’ (the last “Nao”) in mid 1819, though, but that may refer to the 1815 trip. There is a story (from the 1800s) that two ships fled Acapulco, very heavily laden with treasure, just ahead of the insurgents, only to be captured by pirates who happened to be lurking off-shore at the time. The story begins in 1521 with Magellan, when sailing around the world discovered the island chain. Spain seemed to believe the lands they discover, and all of its resources, belong to Spanish monarchy. Magellan waded ashore from the Spanish Galleon, and claimed the islands for the King of Spain. Unfortunately, the natives disagreed, and fought the conquistadors. Magellan and many of his crew perished in the battle. Later expeditions sailed the Tornaviaje, “twisting voyage”, sailing low going west then sailing high going east. In 1543 the colonized islands were named Las Islas Fillipinas, after King Phillip. Thus began the Manila Galleon trade to and from Acapulco. 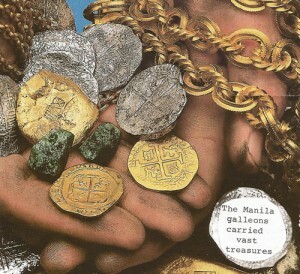 Silver and gold from Bolivia was shipped to Manila, to buy pearls, jewels and silk from the orient. The slow sailing Galleons, overloaded with treasure, became targets for privateers “pirates” who dared to challenge. The privateers heard of the Manila Acapulco trade in the Pacific, and sailed around the cape. The Spanish Galleons would usually defend the treasure with a barrage of cannon balls. The swift Pirate frigates would sail along side, and board the Galleons, overpowering the crew. The pirate raids caused King Phillip to send a Spanish Armada to attack England. With the loss of Spanish ships, and eventually the Mexican war of independence, the Manila Acapulco trade route faded from history.